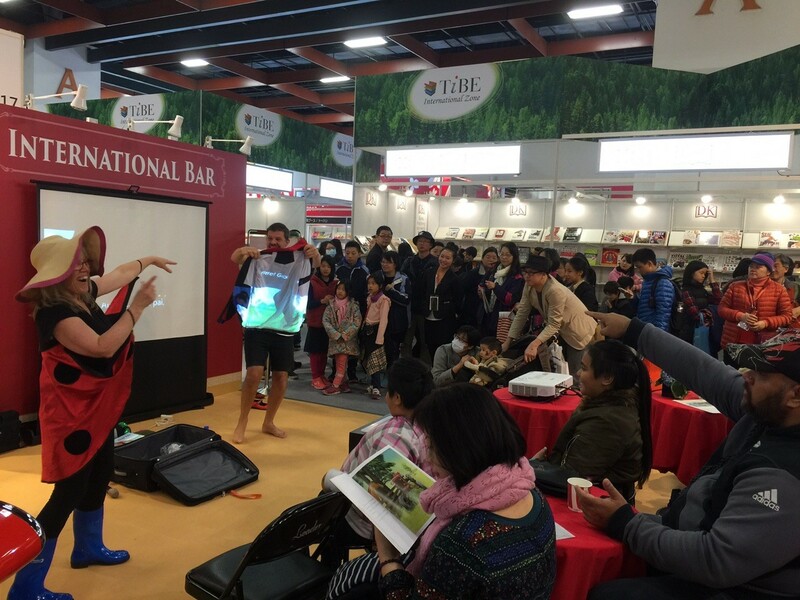 We have just returned from our first overseas trip with Te Reo Singalong books. We were part of the PANZ (Publishing Association of NZ) stand at the Taipei International Book Exhibition (TIBE), thanks to some very generous funding help from Education New Zealand. 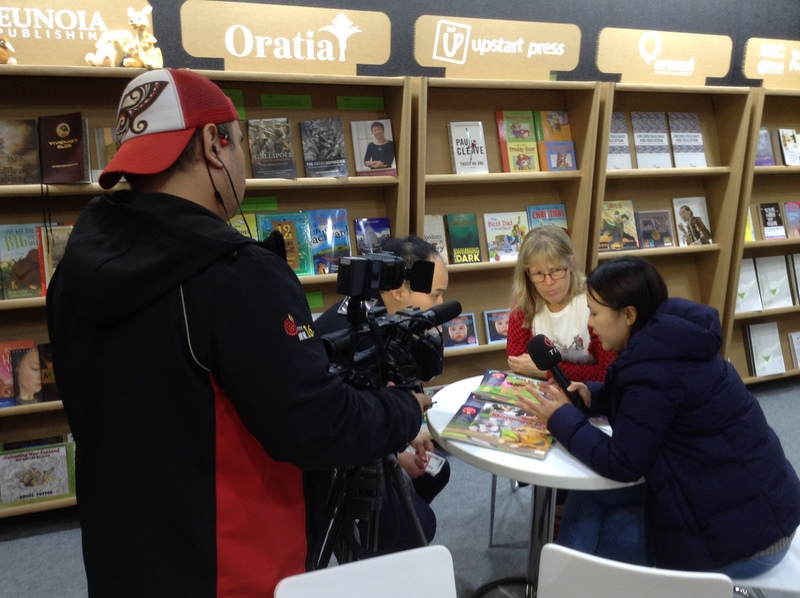 During our time in Taiwan, we met with other educational publishers, talked about the possibilities of publishing our books in other languages, and performed our Te Reo Singalong show. I was also interviewed for a news item on the Taiwanese national television channel. We left New Zealand just before midnight on Waitangi Day and flew to Taiwan via Hong Kong. The first afternoon at the Taipei International Book Fair was all about visiting the stand, meeting the other New Zealand publishers, setting up our shelving area at the New Zealand stand, and getting some very long overdue sleep! The next three days were full of meetings, visiting other publishers, and attending events in the evenings. The first evening event was our New Zealand stand reception, which was an event attended by publishers from around the world. The acting director of the New Zealand Commerce and Industry Office in Taipei, Tupe Solomon, was also there. Tupe is the equivalent of our ambassador in Taiwan and it was wonderful to attend a special (and very delicious) dinner with Tupe, her husband and other staff members and NZ publishers on Friday evening. We had some very interesting meetings with publishers and made some excellent contacts for the future. The language differences were often a challenge but we had lots of wonderful help from the helpers on our stand, Johnny and May. It’s not easy explaining Te Reo Singalong books to people who don’t speak English, so there were a lot of hands moving around. Our Te Reo Singalong books are printed in Taiwan, so it was wonderful to meet Raymond and Nicole from Choice Company during our visit. One of the photos on this page shows Alan and I in front of our stand with Raymond and Nicole. The man at the far left of that photo is Chris Shaw, who’s the man from Book Systems International, based in Auckland. Chris’s company makes it easy for us to bring our books into New Zealand. It’s a small world, after all, because Chris is also the cousin of Stacy and Graeme who sing on our CDs! One of the highlights for us was performing our Te Reo Singalong show twice on Saturday afternoon. Music obviously crosses the language barrier, and it was wonderful to see children from other cultures bouncing around to the beat. It was also great to see Tupe and her family again – and we were thrilled to have Tupe’s daughters joining in with the Matariki actions. Thanks to Education New Zealand and PANZ for helping us to take Te Reo Singalong to Taiwan! © Copyright 2018 EduMaxi Limited. Te Reo Singalong is a product of EduMaxi Ltd.